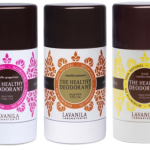 For years, I’ve been on a mission to find the best, healthiest, deodorants on the market. I don’t ask for much, no aluminum, no parabens, no PEGs (which is in most leading brands…) All gnarly known carcinogens. Ironically, I also avoid most homemade versions. Since, they’re usually loaded with baking soda (tried making one myself and I literally burnt my armpits… Took months for them to heal it was so harsh. Sorry, all you baking soda armpit preachers… Tipping my hat to you if it does the job. But please – avoid that route if you have sensitive skin. I’ve tried so many brands over the years I can’t even begin to list them all. I’d rather concentrate on the few standout ones I’d recommend most. Trust me, I’m blessed with sweat glands that work all too well. I need something that is strong enough to hold-up. In a perfect world, I’d say I found a miracle product you apply once and smell like candies all day- sorry, not the case. I find even the best, top quality, organic deodorant brands require a few applications throughout the day to keep smelling good. (UPDATE 2018): Tom’s of Maine recently lost their “CRUELTY-FREE” approval… YIKES, personally – I won’t be using them anymore. No stranger to: Tom’s deodorants! I’ve purchased many over the years. Different smells, types: rolls-on, sticks, long lasting, naturally dry- you name it, I pretty much tried it. They’ve mastered the scent factor, they have some fun ones to pick from including: “honeysuckle rose”, “citrus zest” to name a few… But those pretty smells, also means harsh perfumes = toxic ingredients. For that reason, I find this stuff kind of burns my armpits a tiny bit when I apply it. It’s one of those products where the first few times you use it, its not bad for a few hours and does the job. But then it just starts to fail. It’s not a deodorant I would tell you to try before running a marathon or something cause you’d come back smelling a hot mess. But if you’re just lounging around and don’t have much planned, it can be a better healthy choice to try. This is the worst of the best pretty much; not the best organic deodorant on the market. First, Ombra doesn’t smell like delicious berries or anything but this is a healthy deodorant that does the job. I’ve only ever had the “sport” or “unscented” versions to pick from. Unscented deodorant defeats the purpose to me so I’ve never tried it but I really like the “sport” version. Yes, it does smell kind of manly but its not strong or overbearing. Think of it more like a good gym smell- fresh and clean. It’s a roll-on bottle, the product is clear and comes out a little liquid’y. I’m more of a stick girl but it’s not that bad. Ombra’s price tag is great (around $5). Considering most cleaner deodorants are never cheap… I’ve scored it on sale many times. Even convinced my boyfriend to switch to Ombra. Finally, my top “Favorite All-Natural Pit Sticks” pick…. My holy grail of all-natural, deodorants if you ask me! Love the LAVANILA brand so much you’d think they’re paying me to write this. Lavanila has mastered healthy pit sticks! Constantly coming-out with new scents and carefully picking only healthy ingredients! The smell holds-up for hours. Plus, it’s nice creamy consistency you’d expect in a deodorant and it never burns… Which most leading brands do to me, especially right after shaving. It keeps on giving back sweet smells for hours after applying it, standing up to test of time. 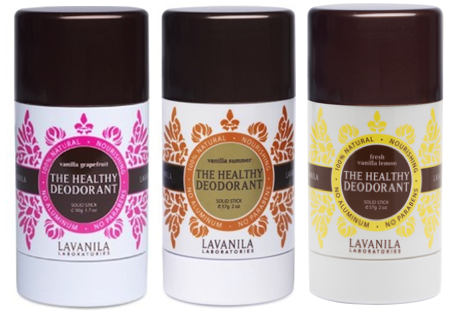 Lavanila released new, clever, travel-size versions. Awesome for when you’re starting to stink mid-afternoon. Its not cheap though! Anywhere from $13 to $21 for 1 deo bar (yikes! I know.) Recently I’ve noticed Lavanila has brought down the price to $17 a stick or $13 for travel size. Trust me, I consider this product to be the best “all-natural” – not organic though, deodorant. Beyond worth the splurge. It’s not the easiest product to find. Buy it, directly from Lavanila.com or you can pick it up at Sephora Stores too – AMAZON of course! Thanks for reading my Favorite All-Natural Pit Sticks! The best deodorant that I have ever used is Ozone Layer Deodorant, which also happens to be all natural. It uses a new patent pending deodorant technology that eliminates odor causing bacteria with oxygen infused into just 2 ingredients, shea butter and beeswax. It is so effective that it can be applied after you already experience body odor because it eliminates the bacteria that cause it in the first place, it is incredible! Check it out at http://www.OzoneDeodorant.com, it’s also guaranteed to work! There’s a product called Lavilin – http://www.lavilin.com – that is amazing at killing odors. It’s all natural and safe and it lasts at least a few days per application. Highly recommended! Next story Air Plants- Great Decorations & Easy to Care For!